Microsoft announced pricing for its Surface tablet with Windows 8 Pro, the more powerful variant of the tablet currently on the market with Windows RT. A 64GB tablet will go for US$899 while the 128GB nabs a US$999 price tag. International pricing was not immediately available. The slates are set to come with a Surface pen, but neither a Touch Cover nor Type Cover are part of the package. Those will have to be bought separately. The two standalone versions will be available in January, though no exact release date was offered. The current Surface runs Windows RT, a not-quite-complete version of the Windows 8 suite. The Pro tablet packs all the Windows apps that are available on a laptop or desktop, plus runs users current Windows 7 desktop applications. Unlike the Surface RT, which runs a struggling Tegra 3 processor, the Surface with Windows 8 Pro has an Intel Core i5 chip on the inside. Possessing an i5 gives the slate a hearty graphics boost, taking its screen resolution to 1920 x 1080 full HD. A full-sized USB 3.0 port and a Mini DisplayPort that can take the external display resolution all the way up to 2560 x 1440 helps the Pro further distance itself from its cruder brethren. 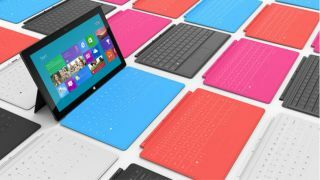 As for the hardware, Microsoft says the Pro-possessing slate weighs less than two pounds and is less than 14 millimeters thick.